Posted on January 4, 2013 by A. The Cold War, and particularly the space race, is a period of history I think about quite a bit. So, when I was visiting my grandmother last month in D.C., I made it a priority to get myself to the Smithsonian Air and Space Museum and see some of their space race artifacts. I had fun. Here is a Soviet space suit from the moon landing that wasn’t. 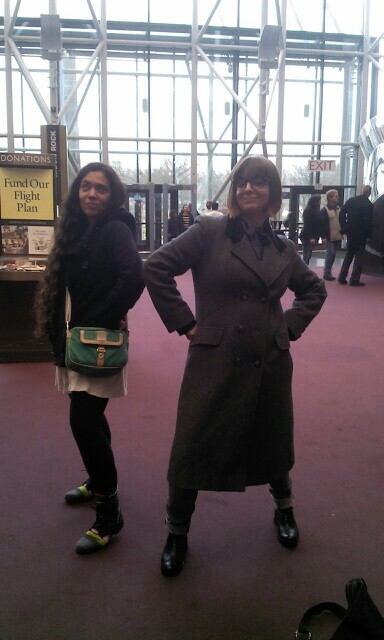 Here are me and my friend T. showing how to properly pose as a space explorer. The Air and Space Museum is kind of weird. Its collection of artifacts is stunning, but the presentation is often tonally strange. It’s a patriotic endeavor, funded by the government with the help of large contributions from American air and space companies. There are a lot of sly digs at the Soviet space program. Sputnik may have been the first satellite in space, say the placards, but the Discovery was far superior in design. I kind of wanted to go through the museum with a fine-toothed comb and a Wikipedia search bar open. The museum didn’t lie, exactly, but it certainly glossed over some pretty critical, if unsavory, elements of the American space program. One of which is the import of Nazi rocket scientists to the United States after the end of WW II. The fact that the U.S. poached Nazi scientists to work on American projects is by no means a secret. It was common knowledge even in the 60s. The character of Dr. Strangelove, for instance, is one long joke about Americanized Nazi scientists. A comic I have been enjoying lately is The Manhattan Projects, a mad science fictional take on the Cold War. I have my particular nerdy nitpicks about the series, but overall I think it’s great. The Manhattan Projects is an alternate history that includes aliens, robots, and transdimensional Toji gates powered by death Buddhists. Wernher von Braun appears in the series with a robot arm. Wernher von Braun appears frequently in the Air and Space Museum. There is no mention of his Nazi origins, or Operation Paperclip. In fact, it’s never even mentioned that he was originally from Germany. Wernher von Braun suddenly appears in the post-war pictures, with no mention of his origins. For anyone with a basic knowledge of space race history, it’s a pretty glaring omission. In The Manhattan Projects, von Braun’s Nazi origins are gleefully examined. Nazi scientists are a staple of the sort of pulp adventure stories the series draws from, and The Manhattan Projects portrays von Braun as a ruthless pragmatist whose primary loyalty is to science. I think history is important. American history, in particular, often gets distorted through a patriotic lens. It’s especially telling, however, when an enthusiastically absurd comic book is willing to address elements of history that a national museum is not. The Air and Space Museum tells its own alternate history, one in which Soviet engineering is always inferior, the American moon landing was predestined, and Wernher von Braun coalesces from the ether after World War II and helpfully takes us into space.